Jump around on the Fitrpo Hop Along Jumping Ball from Champion Sports. A fun way to get a cardiovascular and muscle toning workout, riders simply sit on the ball, hold on, and begin jumping. The 42 cm pon pon ball is the junior size in Champion Sports collection of Hop Along Balls. They offer the best performance in rebound elasticity and strength, and feature an exclusive handle fitted directly into the mold of the ball, so your ride is stable. 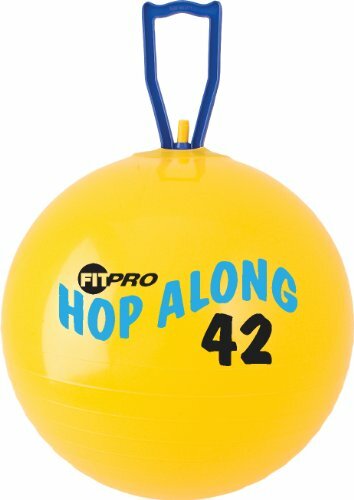 The Hop Along Ball is also a fun activity for kids. BodySport FusionBall 7.5 - 10" Mini Fitness Ball - Use for pilates. Inflates with included straw. Ideal for isometrics, Core work. No pump necessary!